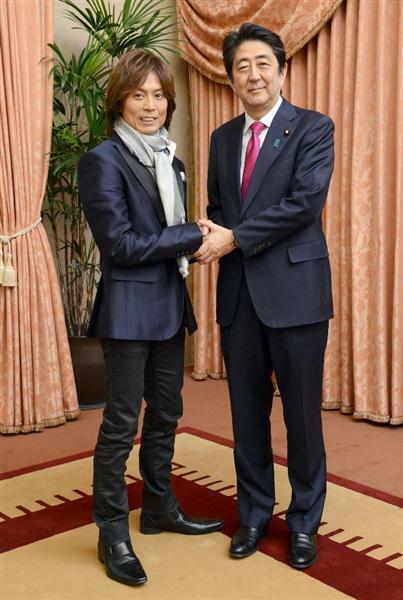 Music Producer Tsunku (49), the musician who lost his good voice, met with Prime Minister Abe Shinzo (61), who also has conquered illness, to discuss how to make the world full of excitement. The two also talked about the future of the entertainment industry and education in Japan despite the fact that the two have faced glories and setbacks with friends and family members. What is the Prime Minister’s favorite song produced by Tsunku? Abe: Thank you for coming to the official residence of the Prime Minister. We are excited about your presence. It’s been two years since you gave a speech at your alumni Kinki University. I was deeply moved when I heard you say that “Everyone has to walk along their own life path. I just have started to walk along my own path just like a freshman as I have lost my voice. We are the same.” I thought that had a lot of important words for the new students who were beginning to live by themselves. Wasn’t full of pride, courage, and self-confidence. What did you think when the college asked you to speak? Tsunku: When I did the speech, I thought about which things I would want to say to the young people who were standing in front of me. It was during the time where I still couldn’t do esophageal speech quite well. I learned a lot from that day because I too had the feeling of starting from scratch. I thought that anything was really relevant when I appeared on stage because, at that time, it been awhile since I stood on top of a stage. My kids have remembered me standing on stages where I was a singer and a father. However, they didn’t see that for a whole year. It’s been a long time for “that father” to stand on stage. My family and I were able to connect with the same feelings with those students. I was grateful. Tsunku: As for practice, I practiced for one year and some months. There was a place where I could sufficient practice in Tokyo that I volunteered at three times a week. I was very grateful for the opportunity. Usually, it would be good if it was a quiet place but inside a car is no good. My voice would be drowned out by the sounds of things like my family or ventilation fan being close to me.During that time, I would communicate in writing on my smartphone. Abe: You were the Tsunku who had a life on the stage and was always singing a song. However, I wonder if whether or not your voice being taken away was a serious decision. Tsunku: I still don’t know whether or not taking my voice was the right decision but when the doctor said “Let’s take away the bad section”, I was in shock. However, my kids were small. And in that case, I had this feeling that I wanted to have a long life with them more than singing and being on stage. I didn’t have any hesitation about that. Abe: I have been thinking that anyone has a chance to make their own companies. I don’t know if this is significant compared to Tsunku’s case but I was able to walk on the path of life while suffering from an incurable disease called ulcerative colitis. It involves a politician’s political life when they publicly announce they have an incurable disease. I had no choice but quit when the illness became during my first term and I honestly talked about everything. Afterward, good medicine was developed and I was able to gain control of the illness sufficiently. So, I thought about the people who have those kinds of problems but wants to make a company that holds their dreams. Tsunku, what do you think how can someone walk on the path of life after suffering from an illness? Tsunku: Even though I cannot stand on the stage, I have narrowed on activity that focuses on creating, something like behind-the-scenes. I think that is conversely good. It didn’t become something like “This or That”, it’s where I can give undivided attention to the production of music. And, anyone can support music. I resolved that “I wouldn’t be able to be a singer anymore”. However, various people said to me that they too have an illness when I made the public announcement. A lot of people were able to give me their warm feelings. Abe: While I was suffering through my illness, my family and I felt each other’s bonds and I thought that I wanted these experiences, that were done by knowing what was precious, to keep on living upon lyrics and music. My grandfather Kishi Nobusuke would often say that. People will have difficult experiences like having setbacks, a serious illness, or being placed in prison. However, with those difficult experiences brings growth, something that is above everything else and is very important. I didn’t know whether or not that last expression was pertinent but my grandfather was a war criminal. He was arrested by the GHQ (Supreme Commander for the Allied Powers) and spent three years in prison (laughs). I also received severe criticism when I resigned from being the Prime Minister. Tsunku: I also received a lot of letters. I got ones from a small child whose father had surgery to people who had lost their voice. My daughter said that she wanted to sing in my place because her father couldn’t sing anymore. I was really happy. My wife’s devoted support was large. Tsunku: Up until my illness, I was the backbone of the household and always worked. However, I was shaken up when I couldn’t work while being sic. And, my wife, who was up til now was silent, immediately changed by saying things like “Is it really ok to go to this said hospital?” or “If changed this said food?”. I also changed. I had a plan that I would always pull my family but to tell you the truth, only I was usually acting recklessly. I noticed that. Abe: When I also quit being prime minister, my self-confidence recovered while being encouraged by my wife. I talked to anyone when I fell into difficult situations. Things like being able to depend on someone is very important. Particularly, my family’s existence is great. Tsunku: Are there any big differences before you quit (your first term) because of sickness and then became prime minister once again? Abe: It seems that I experienced setbacks. Frustrations are always etched in my heart. I always think about things like “Why does it seem like I failed?” or “Despite the fact that it was great doing that way.” That became the source of nourishment after I came into power with a new administration. I thought that if I have failed once, this Abe administration would have none. Tsunku: But, there is a lot of people who had failed once but had no failures the second time around. Why is that you got it right the second time around as a Prime Minister? Abe: I wasn’t able to achieve just by my thoughts and strength. I thought there would be none of that in my second if I was able to do it over again. In addition, it became a situation where I had to something about the state of affairs around the world and Japan. That was determined when I was running for Prime Minister elections on the behalf of the Liberal Democratic Party. Although there was a suggestion of “If you face crushing failure from your second Prime Minister election, it will become like piling shame on top of shame”, that wasn’t the reason why for coming forward as that kind of candidate who wanted to take that social status. I thought “I have to make the best use of the experiences of failure for Japan’s harsh state of affairs. Nothing can be done if I say it’s no use if it’s bad? Heaven doesn’t hold me.”.A lot of people opposed the decision of me running but my wife told me “Please do it if you think it’s for the sake of Japan”. Tsunku, you constantly cherish “The Feelings of Gratitude”, right? Tsunku: because I am a person from Osaka, we would often use the word “Thanks a lot”. However, I became sick and my wife said to me “Real gratitude is no good if you have to express only by speaking it”. More and more, I began to think about the meaning of the word “gratitude”. Abe: When the opposing party’s questions are harsh, my wife would tell me at home “You have to tell them “That is well said” when I would tell her a critical thing (laughs). I wouldn’t easily go to that extent but either way, gratitude is important towards the people who work behind the scenes. Whether or not to truly give gratitude might be accidently seen through by the opponent. By the way, not only in Japan but your activities are expanding, right? Tsunku: I was in charge of the idol group project Morning Musume but had to quit unfortunately after I became sick. But, my wife said to me “You are clinging onto your current self, wouldn’t you want to change something?” I thought about what she said and I started to work both in Japan and Hawaii since June 2016. Then, I was able to see a lot of things. I thought things like “Tokyo is a really wonderful town” and “Japan is a very excellent country” Even though the hospital was crowded, I was able to be examined on the same day. In Hawaii, unless it’s an emergency, it is common to book an appointment about two weeks out. And yet, Hawaii is a place that I get excited nonetheless. But, when I go and buy Hawaiian electrical appliances, the Japanese ones aren’t very small. I thought “What the heck? Despite them having a lot of wonderful appliances” and “Music must be the same!”. “But why can’t Japanese music soak more into the World?” I recently felt like that. That is why I have to try my best. Abe: Anyone who leaves Japan will take notice of Japan’s good points. The same goes for food. Japanese ingredients are a bit high but very delicious. But, if you think that they aren’t well known, they can’t be well known no matter how much time passes. Restaurants that use Japanese ingredients are spreading around the world and agricultural produce that say “I want to eat real Japanese foods more” is selling well. But, they don’t have more confidence. How do you enjoy your activities going between Tokyo and Hawaii? Tsunku: In Hawaii, there is a lot of cooperation between fellow Japanese people. Even when my wife became sick while I was in Japan, they came to help her with tender care. If it was Tokyo, it wouldn’t be impossible to ask a person that you don’t know to look after your kids? Abe: At the end of last year, I visited Hawaii’s Pearl Harbor. Japan and the US have exchanged violence and fighting but these two countries have become an alliance of hope as our strong bonds are linked now. The visit had the meaning of comfort the spirit of the dead. However, the power of reconciliation is a necessary. We have accomplished various things like mutual trust and jointly combining our powers together after 70 years. Due to the power of reconciliation, that became possible. War is unceasing in the world and hatred is called hatred. For this reason, that is why it’s very important for companions to forgive one another and understand together. This power of reconciliation is pointed to the world with President Obama and now is the time that it shouldn’t be transmitted. Japan is expected to play a role tightly together with the other countries. Therefore, I want Japan to go out this year and try it’s best to be the country that shines in the middle of the world. In the lyrics of Morning Musume song “LOVE Machine” that had music and lyrics produced by you, you have the lyrics “Nihon no mirai wa sekai ga urayamu” (translated as: “Japan’s future makes the world jealous”). Those lyrics concurs with our advancing policies. Abe: Surely, Japan will go out and become a country that shines in the middle of the world. Tsunku: It means that even in a depressed society, there is an ideal future. By the way, concerning the Japanese entertainment industry, what do you think? Abe: Japan is placed 3rd in the worldwide Gross Domestic Product (GDP) measure. It was 2nd with the Liberal Democratic Party (LDP). If that’s the case for the Japanese entertainment industry, I think it would better if more people could enjoy Japanese songs, movies, and novels. There is a handicap to Japanese songs as there aren’t in English. But didn’t Sakamoto Kyu’s song “Ue no Muite Arukou” reach #1 on the American Billboard charts? Therefore, I think the Japanese entertainment industry can go out more into the world and it is something I want to support. Tsunku: The gifted education of entertainment is probably unimaginable. It is the elite study of the kids who enter a school that is affiliated with a college. It is similar to making a place for training of people who want to do sports or entertainment. What do you think of fostering worldwide entertainment like fostering a young ping pong player that doesn’t lose to China? Japan is great at making boxed items but if it’s the entertainment industry, it probably wouldn’t shine in any establishment in of that middle of that? Abe: Entertainment from America is a big industry and they also foster human resources. It might be good for Japan also to take notice of this more. Reporter: Tsunku, you have been saying “Even though I lost my voice, I want to produce things that make people excited”. Is “Excited” the keyword for the Prime Minister too? Abe: You can’t get excited at deflation, right? One might accidentally think things like “How can I go to a cheap store?” or “I want something now but if I wait for it, couldn’t it become cheaper next year?”. However, if you wait for it, the salaries will be lowered, unfortunately. On the contrary, if the prices rise, many will make higher value things (like products, salaries, and etc) than cheaper ones. This thinking will appear often next year than this year, and even more the year after next. This kind of thing to make an excited Japan is maybe the theme of this year. Abe: Once before, I was criticized when I said, “Let’s do a constitutional reform while being excited”. (Laughs) However, I have parted ways of the idea of thinking about being proactive. And, it gradually made me going towards a gloomy course. I thought in what way can I create a future for Japan. Shouldn’t it be excited? Therefore, now is the time to free Japan from deflation and have that excited vigor like LOVE Machine. I want to make a one million total success society that shines in the middle of the world.I got encouraged by you, Tsunku, today. Thank you. Tsunku: Thank you very much.